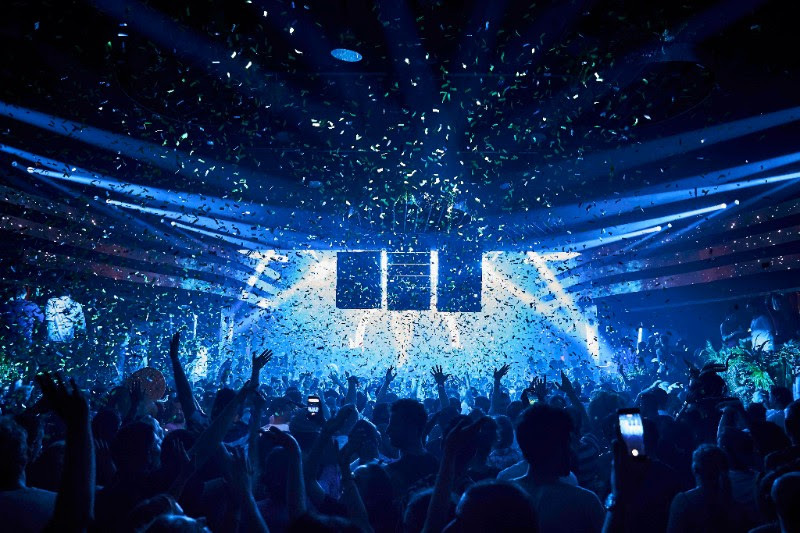 Hï Ibiza’s official Opening Party on Saturday 26th May marked the start of season 2 for the Ibiza superclub, with thousands of party revellers eager to witness Black Coffee’s return to the Hï Ibiza Theatre and discover what’s in store for the season ahead. Black Coffee’s debut Ibiza residency at Hï Ibiza was one of the most talked about parties on the island in 2017 so anticipation was high for the first date of the South African house hero’s 20-week residency this summer. Joined by guests including &ME, Audiofly, Blond:ish, Guy Mantzur, Mandar, Salome, Serge Devant and Themba, with Ibiza favourites Housekeeping hosting the Club room, and Melon Bomb taking on the Wild Corner all night long, Black Coffee and friends soon proved that there’s only one place to be on Saturday nights in Ibiza. With a killer soundtrack and extended opening hours, keeping the crowd dancing well past sunrise, highlights from the night included two special unannounced back-to-back sessions, with Blond:ish playing b2b with Salomé and Black Coffee stepping up for a B2B with both &ME and Blond:ish. Take a look at some of the highlights here. So what’s coming up for the rest of the summer?! Starting with the weekend…. Hï Ibiza will be home to Glitterbox’s 21st century disco, every Friday, from 1st June to 28th September. Expect star-studded line-ups, flamboyant performers and the unmistakable soundtrack of dancefloor gems, uplifting house and fresh disco cuts from acts including Basement Jaxx, DJ Harvey, Groove Armada, Honey Dijon, Masters At Work, Todd Terry and much more. Following a unforgettable opening party, Black Coffee’s influential Hï Ibiza residency continues everySaturday through October 6th. Expect a heavy dose of house music with Black Coffee joined by an impressive roster of international talent including Âme, Apollonia, Blond:ish, Guy Gerber, Jamie Jones, Luciano, Nastia, Red Axes and The Black Madonna, with Housekeeping hosting the Club. Cream Ibiza moves to its new home at Hï Ibiza this summer, taking over Sundays from 24th June – 23rd September. As the island’s longest running UK club night, Cream continues to be a must-visit party in Ibiza each year. Expect to see some of the biggest names in dance music, including Diplo, MK and NERVO, playing alongside Cream Ibiza’s long-established residents, with British hit-maker Jonas Blue, hosting the Club room with his Electronic Nature concept. GangStar Ibiza is a brand new hip hop and urban music concept taking over Mondays from 4th June – 24th September. Created by The Night League and Cathy Guetta, the party will be serving a mix of urban music classics, hip hop, rap and R&B beats. Watch out for a line-up announcement coming soon. Eric Prydz returns to the Hï Ibiza Theatre every Tuesday from 10 July – 25 September, joined weekly by Camelphat and Christoph. Expect more of the same immersive spectaculars for 2018 as Prydz treats crowds to a blistering and inimitable blend of house and techno along with a visual and audio experience like no other. Meanwhile, over in the Club room, influential Manchester duo Solardo will welcome Mason Maynard, Lauren Lane, Monki, Huxley, Secondcity and more to their Club Solardo residency. Wednesday nights fast became one of Hï Ibiza’s most popular residencies in 2017 thanks to Armin van Buuren ruling the Hï Ibiza Theatre and house innovators Sunnery James & Ryan Marciano in the Club. With another series of high octane sets planned every Wednesday from 20th June – 19th September, the residents will be joined by guests including Aly & Fila, Andrew Rayel, Cosmic Gate, Fedde Le Grand, Markus Schulz, Roger Sanchez, Sam Feldt and much more. New for 2018, Tale Of Us bring Afterlife back to where it all began. Running every Thursday from the28th June to the 4th October, Afterlife 2018 looks set to be a game-changer for Ibiza, with a boundary-pushing line-up that includes Dixon, Nina Kraviz, Maceo Plex, Ben Klock, Helena Hauff, Carl Craig, Tijana T, Jon Hopkins to name just a few. One of Hï Ibiza’s most unique features is its complete transformation from one night to the next, with a bespoke production for each daily residency designed to heighten the overall clubbing experience. In 2017, guests were mesmerized by lazers at Armin van Buuren’s residency, dazzled by dancers and disco balls at Glitterbox, enraptured by the epic light show at Eric Prydz’s Tuesday night takeover, and much more. Expect more of the same in 2018, with lots of new surprises in store. One of last year’s most popular hideouts at the club, the ‘Wild Corner’ makes a heroes return this year. Affectionately nicknamed “the disco toilet”, the Wild Corner played host to some legendary music moments in 2017 and fans can expect another exciting programme of DJs set to perform in 2018. And of course, for those chill out moments, partygoers can relax and unwind under a canopy of stars in the luxurious open-air gardens complete with tipis and cocktail bars. All this plus 2 miles of streamers, 86 lasers, 100 speakers, 300 lights, 1000kg of C02 and 5 million video pixels at every party makes for a truly memorable party experience. Find out more and book tickets at hiibiza.com.